Product prices and availability are accurate as of 2019-04-16 05:15:28 UTC and are subject to change. Any price and availability information displayed on http://www.amazon.com/ at the time of purchase will apply to the purchase of this product. Top diameter of net: about 35cm/14"
The bottom circumference of net: 500cm/197"
Note: If you choose the "Net without stand", we sent Net only. 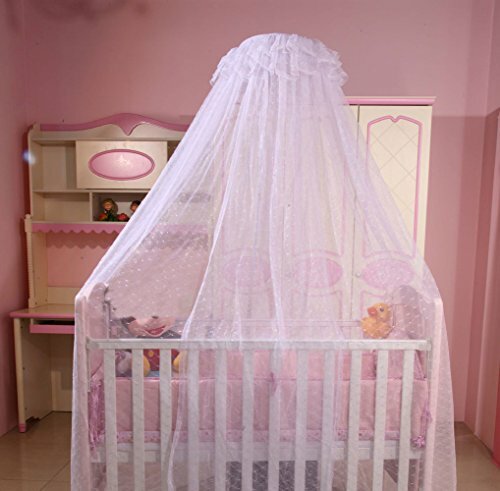 Featuring an opening, easy to get to your baby when he/she is crying Tiny mesh holes that keep the bugs out but let the cool air in, create a good atmosphere for sleeping It can also protect baby's eyes offending by dazzling light, let the baby sleep more comfortable Can be used over cribs, toddler beds; Great addition to a baby nursery/little girls, boys room Detailed size: Top diameter of net: about 14"; Height of net: 79"; The bottom circumference of net: 500cm/197"